Aimtec’s new open frame 1 Watt AM1LO series with unregulated output in SMD 8 pin package features a Rated Working Voltage of 250Vrms or 400 VDC, EN55032 class B compliance, efficiency up to 75% and very low Isolation capacitance of 25pF. Operating within an ambient temperature range of -40°C to +105°C with full power up to +100°C and 80% output load at +105°C, the AM1LO series is designed for versatility and can be integrated into a multitude of applications, such as digital circuits, low frequency analog, building automation systems or control units. 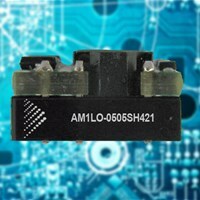 Available in a compact surface mount (SMD) package (12.70 x 11.20 x 6.85 mm), the AM1LO1 is offered with Input to Output Isolation of 4200VDC for easy integration in smart devices, telecommunication, and computer applications.